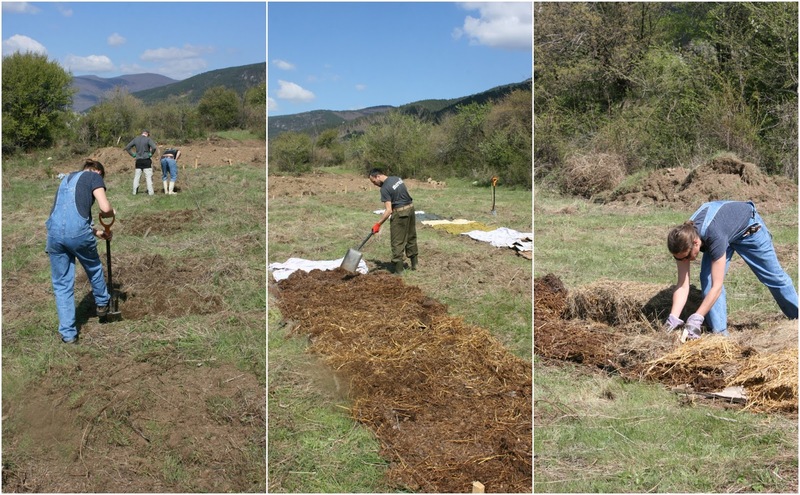 Balkan Ecology Project : The Results - A Trial Looking at 5 Ways to Prepare Beds for Tree and Shrub Planting - Which one is the best? 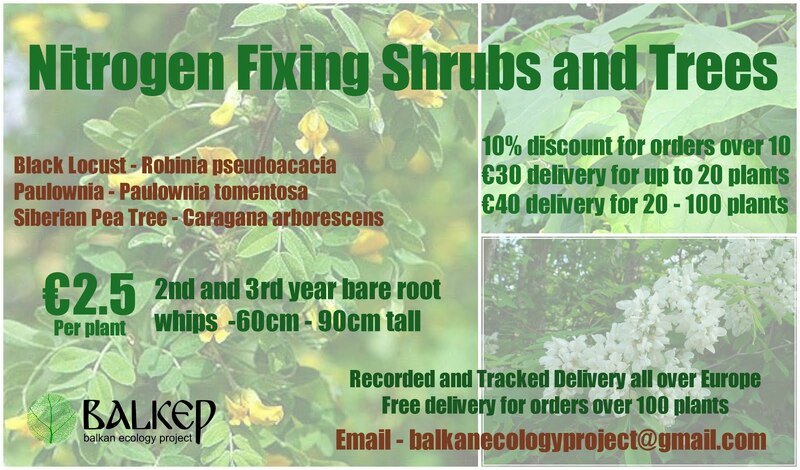 Last year we started a trial to discover the best ways to prepare the ground for tree and shrub planting. We trialed five different methods and recorded the performance of each method looking at how long they took to implement and manage, how much they cost and how effective they are. I'll start the post with why we prepare our ground in advance of planting then we will look at the goal of the trial, overview of the trial garden, overview of the trial itself and finally present the trial results. 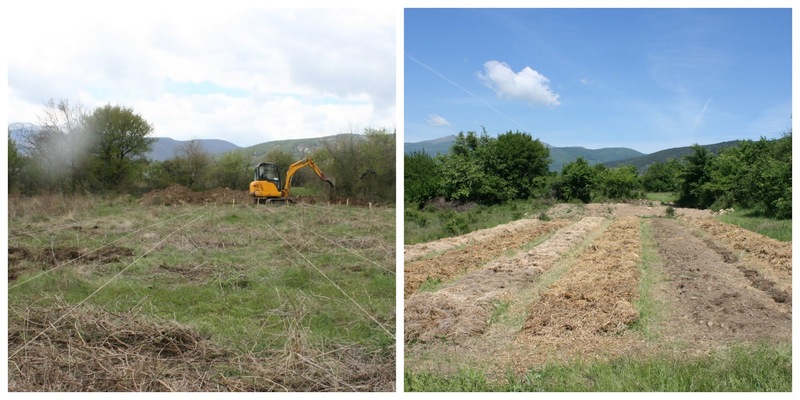 When planting trees and shrubs into grassland or fields previously used for agriculture, I prefer to prepare the area at least 6 months ahead of planting - 12 months is even better. We often prepare the planting zones in early spring for late Autumn planting. I call this "advance planting preparation" or APP for short. What is it ? 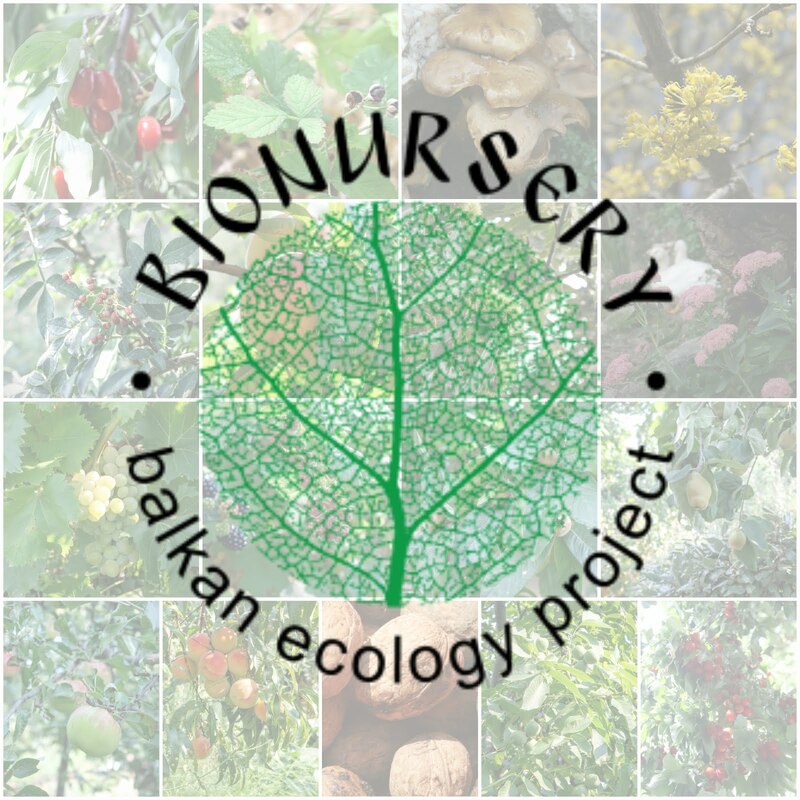 - It's basically the addition of organic matter into the planting zone 6 - 12 months before planting out to improve the soil conditions for incoming plants. This can be in the form of mulches that suppress existing growth and decompose in situ or in the form of green manures that replace the existing growth and improve the soil. It's generally acknowledged that early succession plants such as grass and forb prefer bacterial dominated soils whereas trees and shrubs prefer fungal. By preparing soils in advance of planting you can alter soil conditions to that which trees and shrubs are more accustomed to. A great way of shifting the soil ecology from bacterial to fungal is to deep mulch the planting zone with high carbon material such as wood chip (preferably ramial wood chip) or with straw at least 6 - 12 months before planting out. 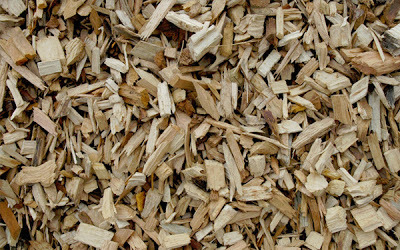 If you live in urban areas ramial wood chip should be very easy to get hold of from your local tree surgeon (often free of charge). In rural areas straw should be available and spoiled straw that has been exposed to the rain during winter is often freely available as it cannot be used for animal bedding. Grass can compete vigorously with trees and shrubs for nutrients and water. The application of heavy mulches reduces or in some cases eliminates the existing vegetation without the need of heavy digging work or the use of tractors and machinery. The vegetation that is suppressed by the mulch decomposes along with the mulch and adds to the fertility of the soil and improves soil structure. You can reduce the expense of time preparing compost or the cost of purchasing it by using fresh manure or other fresh organic matter layered as sheet mulch. Doing so 6 - 12 months ahead of planting allows enough time for the material to decompose in situ to levels that are not harmful to plants. Mulch provides good habitat for a range of invertebrates many of which are beneficial in our garden ecosystems. Slugs and snails will also shelter in the mulch and this often attracts slow worms, toads, frogs and lizards that feed on them under the safety of the cover. Ground beetles and a range of spiders will also make home in the mulch and perhaps the most beneficial of all the soil dwelling organisms, earthworms, will settle and multiply under the mulch slowly bringing the material down into the soil, providing micro drainage, improving structure and creating some of the best plant fertiliser around - vermi-compost. When using green manures you do not find the above benefits, but green manure can improve the soil fertility, relieve compaction, improve the soil structure providing better drainage and water retention, suppress weeds and attract beneficial insects and pest predators. For large areas you often need to apply large quantities of mulch and manures which means importing from offsite. If you can tap into local waste streams (as mentioned above) this is fine but it some places it can be expensive to purchase and transport these materials. 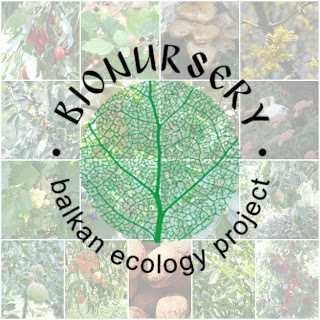 Plants that grow via rhizomes and runners such as brambles and couch grass may grow through or around the sheet mulches and green manure cover. This can be overcome by removing these plants before mulching, or spot weeding as they reappear. If the area is dominated by pernicious weeds it's probably best to take the time to remove them before mulching or sowing. On heavy clay (especially compacted clay) applying mulch to the surface is not very effective as is not easily naturally incorporated into the clay. Furthermore the clay layer can form a barrier or "pan" that prohibits plant root growth and water percolation. 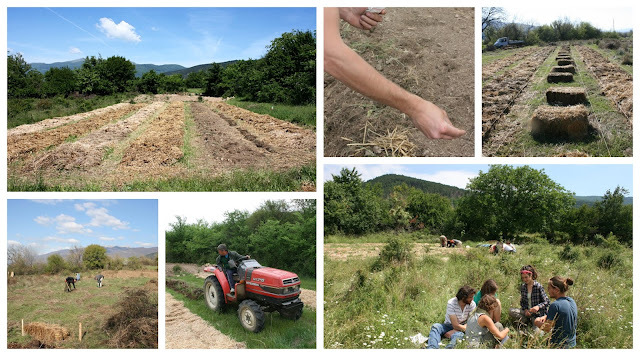 In such cases it's necessary to incorporate the organic matter into the soil via double digging or deep ploughing the area, adding the organic matter and then rotary tilling. The initial work is intensive but it is a one off investment in time and energy, and following this applying organic matter/mulch to the surface will work (so long as the area is not compacted again). On all compacted soils it's worth breaking the compaction and relieving any hardpan that may be present before adding mulch. In most situations it's necessary to prepare a seed bed when using green manures and this often entails ploughing and tilling the area for large areas or digging over and raking for small areas. Always apply a mulch following periods of heavy rain or water the area well beforehand to ensure the soil is well hydrated. 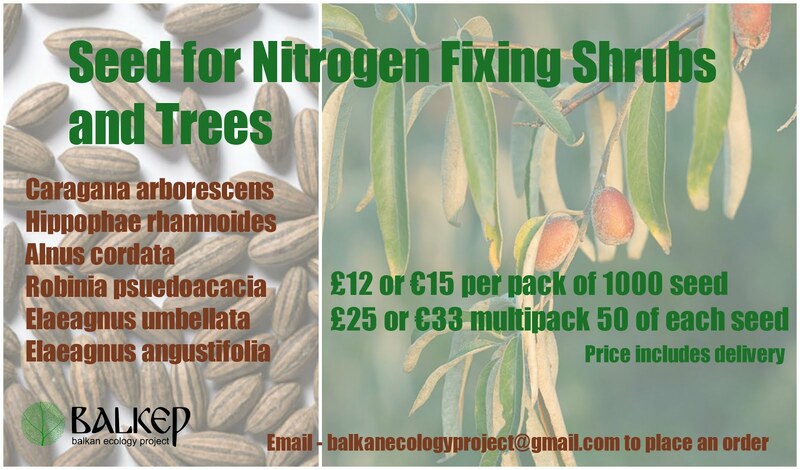 This will activate the microbiology in the soil that play a critical role in nutrient cycling. There are a number of different ways you can implement APP using organic or inorganic mulches and a diversity of options within those categories, using multiple layers of mulch, combining soil disturbance (forking, turning. 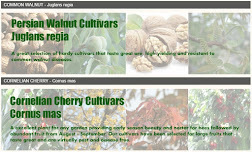 tilling) with mulching or concentrating efforts solely to the planting zones or treating whole areas. 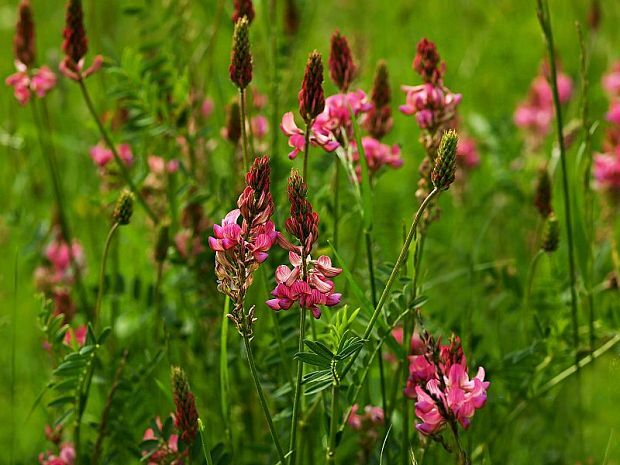 When using green manures there are a wide range of species to choose from and various mowing/ incorporation strategies you could use. To a large extent the method you may use will depend on what resources you have available and the initial condition of your ground. Our goal for this study is to establish APP methods that are inexpensive, time efficient and that will provide the optimal conditions for the incoming plants. 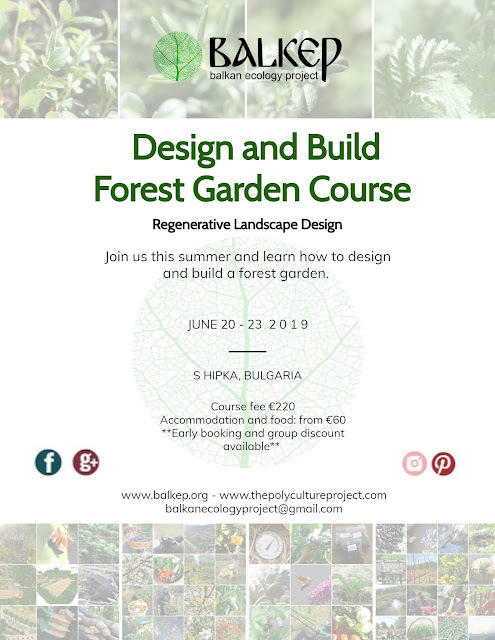 Before we go on to profile each of these methods, here's an overview of the garden we are working on and a description of the trial. The trail site before and after. The mini digger in the background is digging a pond on the plot and has nothing to do with this trial. 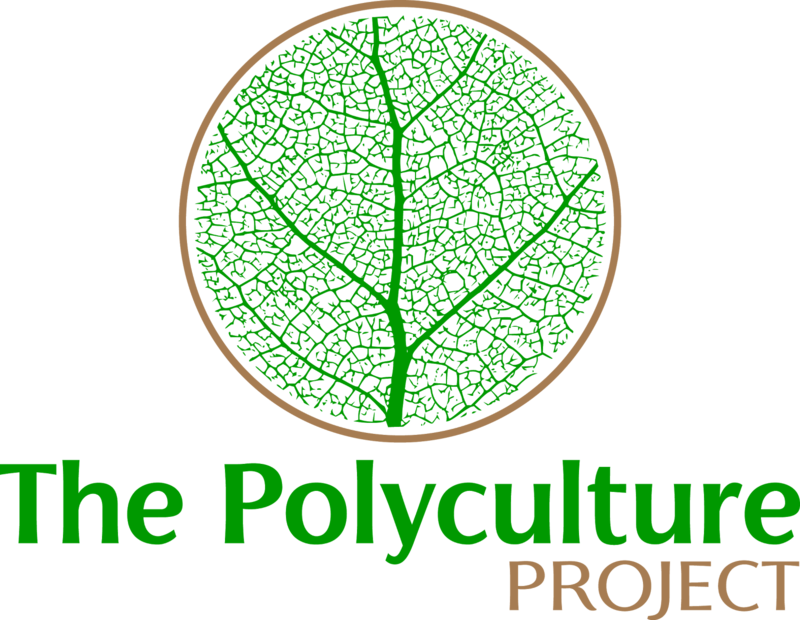 We combine the plants and habitat together in polycultures and experiment with these polycultures in order to discover best practices that can produce nutritious affordable food while enhancing biodiversity. 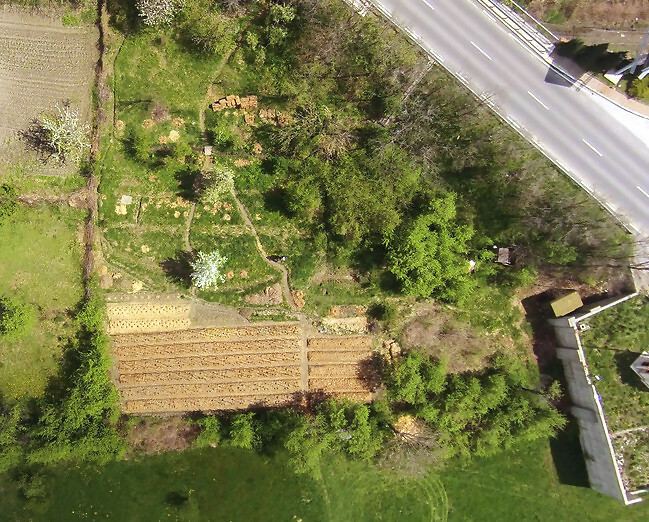 The trial plot is 337.5 m2 and is composed of 6 beds each, 1.5 m wide and 25 m long. 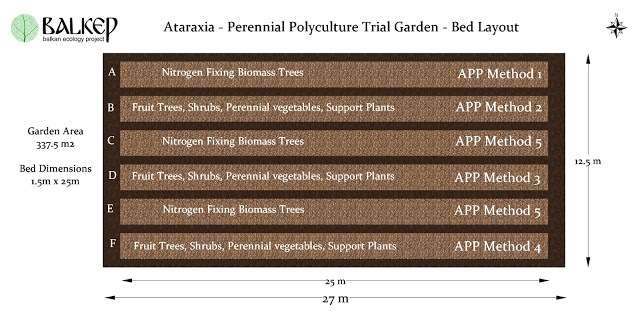 The beds are labeled A - F. Beds A, C and E are designated for biomass (support) plants and Beds B, D and F are designated to perennial polycultures (for the species list of these beds see here). The biomass beds A, C and E are prepared without the addition of manures as the biomass plants we are using grow well in soils of low - moderate fertility and as the purpose of growing these plants is to provide fertility to the productive plants in the adjacent beds it does not make sense to use fertility additives to grow these plants. 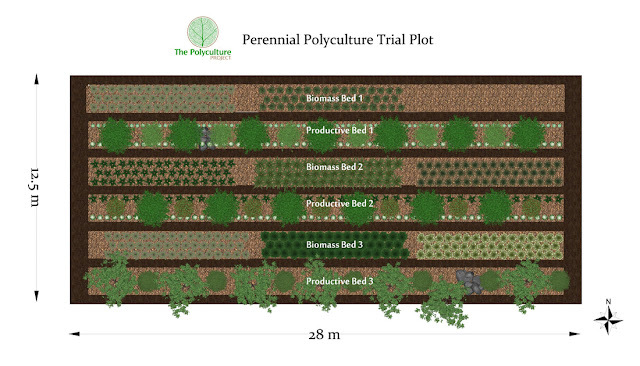 The perennial polyculture beds will include 3 layers of productive plants and a bulb layer so we want to boost fertility and improve soil structure for the initial planting hence each method includes the fertility additive. 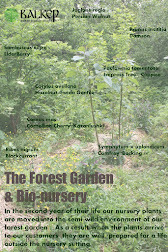 In the case of Bed B we used green manure and for beds D and F we added manure. 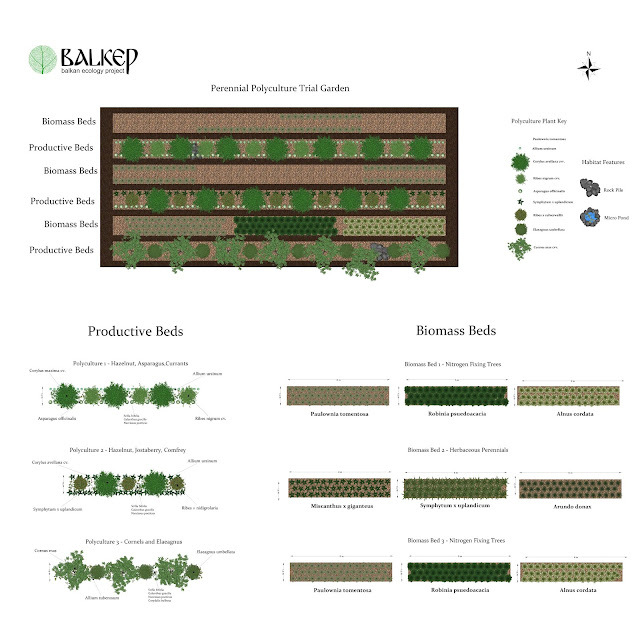 The table and diagram below indicates the APP method used for each bed along with the planting culture. 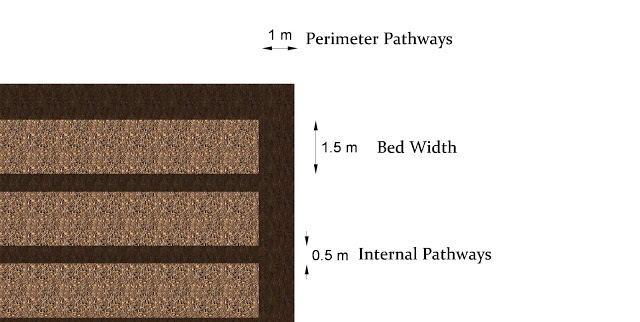 The pathways between the beds are 50 cm wide and the perimeter pathway around the trial beds is 1 m wide. The width of the pathways was determined by the width of the lawn mower we use. We keep the existing vegetation on the pathways and mow them regularly throughout the growing season (April - Sep). Mowing the vegetated pathways provides an excellent source of biomass with each 27 m long pathway producing approximately 30 L of trimmings per mow which may be as often as once per week if we have had rain. The trimmings are deposited around the base of the fruit trees and shrubs in the perennial polyculture beds (as long as it's not full of ripe seed). Root biomass from the roots is also shed following a cut. Once decomposed this root biomass provides a great source of fertility in sub and top soil for the surrounding plants. 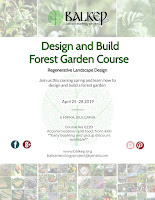 Furthermore, the vegetated pathways also provide habitat, notably forage for beneficial insects, when plants flower during the months we are not cutting, namely late autumn - early spring. Another advantage of our vegetated pathways is that they provide comfortable access during very wet periods and do not become muddy. The perennial polyculture trial beds - 6 beds - 1.5m wide and 25m long with 50 cm internal pathways and 1m wide periphery pathways. A is on the far right. 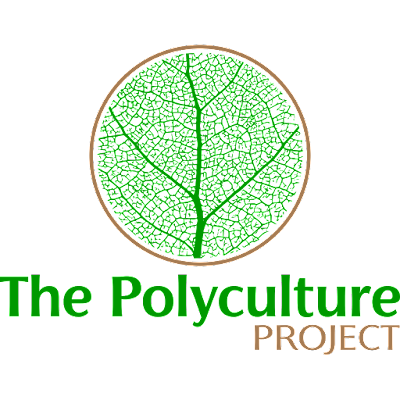 So let's look at the 5 different methods we tested to prepare the ground for planting our perennial polycultures. All of these methods are intended to be applied 6 - 12 months in advance of planting and are best implemented when the soil is moist, for example, following heavy rains when the soil profile is thoroughly soaked but has had enough time to drain and is not water logged. 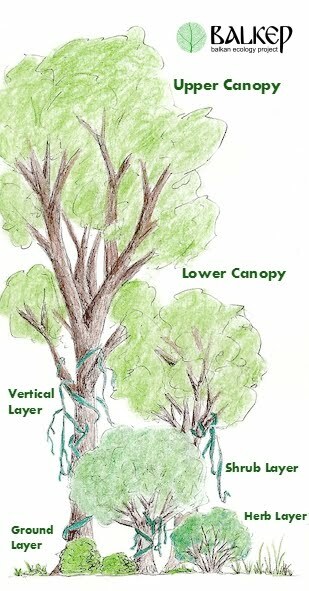 Method one entails slashing the existing vegetation to ground level and applying it to the surface of the planting area. A layer of inverted sod is then applied to cover the surface of the bed. In some cases you may wish to dig out the top soil from the pathways and this can be inverted on to the bed area. In our case we wished to leave the pathways grassed and used top soil removed from a pond excavation on site. Following the top soil a layer of straw mulch was applied approx 10-20 cm deep. Method two removes the existing vegetation and replaces it with plants that can improve the soil for the incoming plants. For example, on sites with low fertility soils, nitrogen fixing green manures are great way to lift Nitrogen (N) to appropriate levels. The green manures can also add significant quantities of organic matter to the soil, improving structure and drainage and serving the needs of beneficial insects. To boost the organic matter content of the soils, the green manure should be cut at regular intervals and plowed into the soil or covered with a straw mulch before planting occurs. In such cases the green manure used should be a fast growing annual cover. An alternative is to sow a perennial cover, cut back at regular intervals (once established) and plant the crops directly into the living mulch. We sowed the following seeds onto the prepared bed on the 18th May. To prepare for sowing we ploughed and rotary tilled the area to provide a good seed bed. We then hand sowed the seed onto the surface before a rainy period was forecast. The use of cover crops to prepare beds for perennial polycultures is something we'll be experimenting with more in the future. Method 3 entails slashing the existing vegetation to ground level, forking over the surface of the beds and then placing a card layer to cover the soil surface and a layer of manure on top of the card. We used approx 30 L of manure per m 2 and finally topped this with a 10-20 cm layer of straw. Forking over the bed, placing a layer of card and cloth, adding 30 L of manure and covering with 15-20 cm deep layer of straw. Method 5 is quite simply slashing the existing vegetation to ground level and applying a 20 cm layer of straw to the surface. Another way is to place a straw bale on the location where each tree will be planted and this works really well if you are only planting a tree layer. However for these beds we intend to plant out 4 layers; trees, shrubs, perennial vegetables and bulbs and we had the bales available so it made more sense to mulch the entire area. We recorded the input of each method looking at how long they took to implement and manage, how much they cost and we took soil analysis to establish how effective each method is. Record of Inputs - The inputs we record are time to implement - time to manage and the cost of each method. 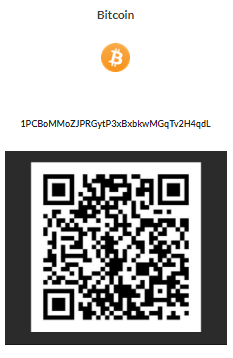 We are looking for the method that requires the smallest amount of resources for the greatest benefit. Time to Manage - How long it takes to manage each method up to the point of planting - i.e mowing, weeding, irrigation. Soil Analysis - We aim to provide the optimal conditions for the incoming plants and measure the effectiveness of each method is by carrying out a mineral and physical soil analysis, comparing these to base samples. Soil Physical Analysis - Annual soil tests are carried out on each bed. The analysis includes a series of 9 simple tests that are designed to provide an indication of soil health based on observable physical properties of the soil. 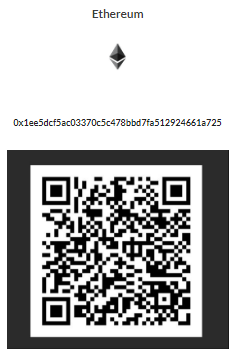 You can find instructions on how to carry out this test here. These tests are compared to a base sample we took before the trail began. Higher marks on the test indicate improved soil conditions. Here are the total number of minutes we spent on each APP method. The management time is recorded from after establishing the beds until the point that we plant out. 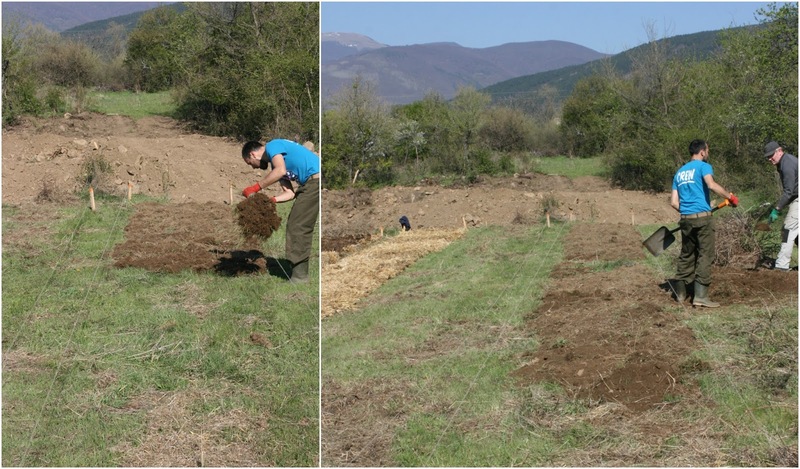 Management tasks include weeding the mulched beds and in the case of the green manure trial cutting back the vegetation in the following spring after planting. The weeding is carried out to check the most vigorous plants that grow through the mulch so there will be little competition for our incoming productive plants. The weeds are collected and composted and applied back the beds later. Here you can see the weed growth in the various beds 3 months after we established the beds. Here are the results of the soil mineral analysis including the base test and a test for each of the beds. Let's look at which method performed best and worst in each of the categories we tested. Time to Implement - No surprise in that APP method 5. Straw Mulch was the fastest to implement and that APP method 3. Fork over and Sheet Mulch took the longest. Time to Manage - APP method 2. Green Manure took the least amount of time to manage and APP method 3. Fork over and Sheet Mulch - took the longest amount of time to manage. Although it's safe to say that APP method 2. Green Manure does in fact take the least amount of time to manage for the other beds the data is not useful as the weeding was carried out by different people at a different pace. If we did this again it would be better to recording individual times and take an average. It is worth noting however that adding a layer of card below the straw mulch is as effective at suppressing weeds as doubling up on straw without a card layer. Personally I prefer to allow weeds to establish and use them as a resource. All the time weeds are growing in your beds they are transforming sunlight, water, oxygen and carbon dioxide into biomass, biomass that can be used to feed the soil and create fertility. I consider the weeds support plants and only feel it necessary to remove them when they may cause competitive stress to the productive plants. The point of weeding in this trial was to compare how well each method checked weed growth and it seems very clear to me that none of the methods are suitable. The time it takes to weed the beds is very high making this restrictive for large scale operations. In order to heavily reduce weed growth an alternative option is to use heavy duty landscapers mat which allows water and gasses to enter the soil whilst restricting weed growth (plant seed that blows in with the wind will still establish). I'd saying growing weeds for support and devising better tools for chop and drop is the way forward for perennial polyculture. Another thing to mention here is that in the sheet mulched beds we actually introduced some pernicious weeds with the manure, specifically Cynodon dactylon - Bermuda Grass which spreads to form a mat and is difficult to remove. Composting the manure in a hot compost pile can kill these weed seeds but is very time intensive and perhaps placing the card over the manure rather than under the manure may slow them but i'm sure the seeds will germinate after the card has decomposed. We're trying out a method where we cover the beds with greenhouse plastic during a hot summers week.We'll see whether this will destroy the roots of the plants too. Cost of Each Method - The least expensive was APP method 1. Inverted Sod and Mulch this is the case as long as you have the top soil on site. The most expensive was APP method 2. 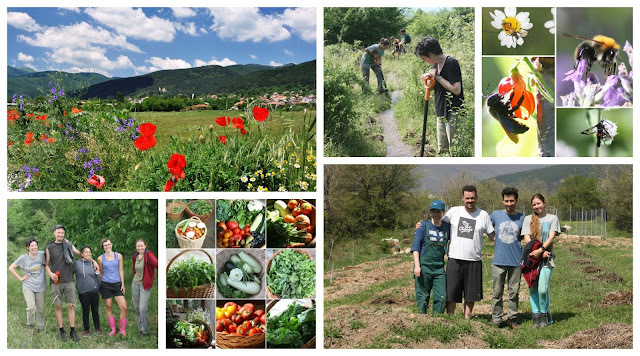 Green Manure. Based on the results of the soil analysis we can get an idea which method provided the optimal conditions for the incoming plants. Soil Mineral Analysis - The APP methods used for the biomass beds A,C and E are not intended to provide fertility. This comparative test is between the methods used on beds B, D and F.
APP method 2. Green Manure proved the least fertile method however it will be interesting to take these results again next year with time for nitrogen fixing green manure plants to take effect. No surprise that APP methods 3. Fork over and Sheet Mulch and 4. Sheet Mulch - (Card-Manure-Straw) provided the highest fertility what with the manure inputs and it's great to see how these methods provide optimal pH levels when compared to the base sample. Soil Physical Analysis - All of the methods improved upon the base test. The most effective method was APP 4. Sheet Mulch the least effective was APP 5. Straw Mulch just slightly worse than APP 2. Green Manure. Our practical experience when planting out the beds in the Spring of this year backs up the results of the soil tests. We found digging the planting holes easiest in Bed F - APP 4. Sheet Mulch and most difficult in Bed B - APP 2. Green Manure. This was the biggest surprise of the trial for me as I was expecting to find that the APP 2 Green Manure - (Plough - Till-Sow) trial would render the beds in best shape for planting what with the ploughing and tilling loosening up the soil profile. 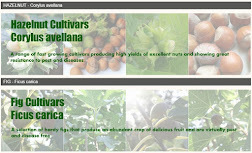 I was pleasantly surprised to see that we can achieve better results without the heavy equipment and soil disturbance. We're looking forward to try out a different set of methods in a new trial garden next year. I'd like to experiment with using plastic mulches combined with green manures, deep spot mulching and rough mulching. I hope you have enjoyed the article and have found it useful. 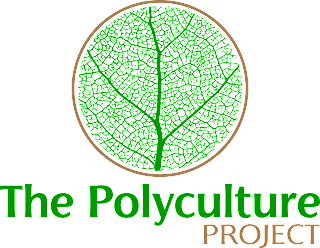 If so please consider supporting our future research and experiments by making a contribution to our Polyculture Project Crowdfunder.